How fast is USB 3.0 really? Macworld Lab ran the DriveStation DDR through a benchmark gauntlet and found that Buffalo’s creative caching method did increase the drive’s write speeds, but we weren’t able to replicate the 2.3 times faster claim. We clocked the DriveStation DDR at a speedy 225.6 MBps in our read tests. We also removed the hard drive mechanism from the enclosure to see what the difference would be without the cache and got a speed of 178.1 MBps—the RAM cache provided a 27 percent speed boost. 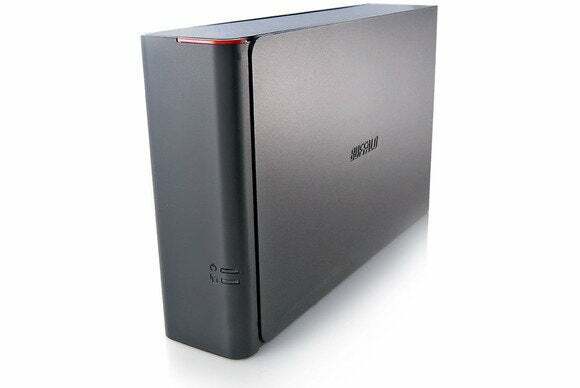 In terms of write speed, the DriveStation DDR outperformed comparable USB 3.0 drives, such as the 3TB CalDigit AV Pro and the 1TB Seagate Backup Plus. However, while the drive’s write speeds increased with the cache in place, repeated tests showed that file read times actually decreased slightly, from 180.4 to a slower 150.1 MBps, a decrease in read speeds of nearly 17 percent. These results remained consistent even when we attached the RAM cache to a test SSD; write times increased while read times decreased. So while writing files to the drive will be a faster with the RAM, accessing data from the drive will not. The DriveStation is best for somebody wanting to set up on his or her desk and never move. It requires its included external power adapter to operate. And while the drive isn’t light at 2.2 pounds, it’s plastic casing is not exactly heavy-duty. When held, the drive feels flimsy—the side panels of the casing bend inward without much force, and the case seems to pick up fingerprints and smudges easily. The Buffalo DriveStation DDR is a fast drive, especially for the price. Despite its 1GB RAM cache, its still not as fast as an SSD, but if you’re looking for an external drive with a lot of storage space, and you don’t want to break the bank on a high end solid-state, the DriveStation is definitely one that you should consider. If you're looking for a fast, capacious, not-too-expensive direct-attached backup drive, look no further: Buffalo's DriveStation DDR uses 1GB of DDR3 memory to dramatically enhance write performance.